Click to buy at Amazon. 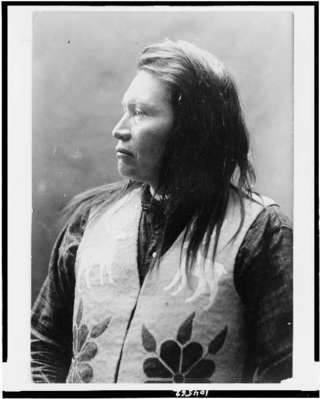 During the attack at Bear Paw, Chief Joseph watched his 12-year-old daughter, Kapkap Ponmi (Noise of Running Feet), flee for her life on horseback in a hail of bullets. He never saw her again. 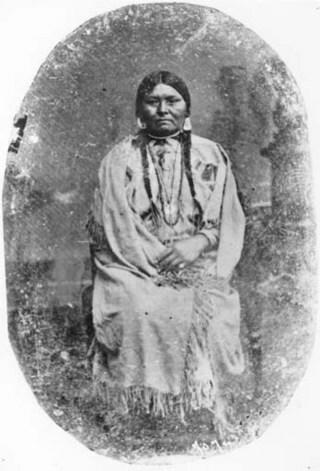 Chief Joseph's first wife, Heyoon Yoyikt (above), survived the War of 1877. His second wife, Springtime, gave birth to a daughter just as the war broke out. 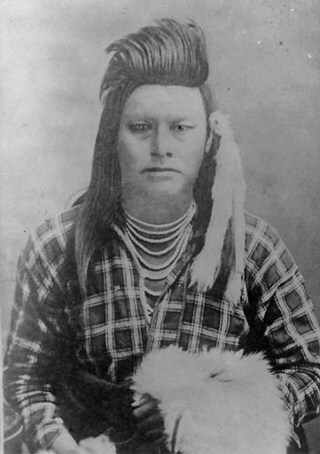 Chief Joseph's brother, Ollocut (Frog), was the leader of the warriors. Author Kent Nerburn (Chief Joseph and the Flight of the Nez Perce) talks about his excellent, well-researched book on C-Span. Nerburn spent four years researching the people, the journey, and the history, including a trek along the Nez Perce trail. Share this book page on Twitter. 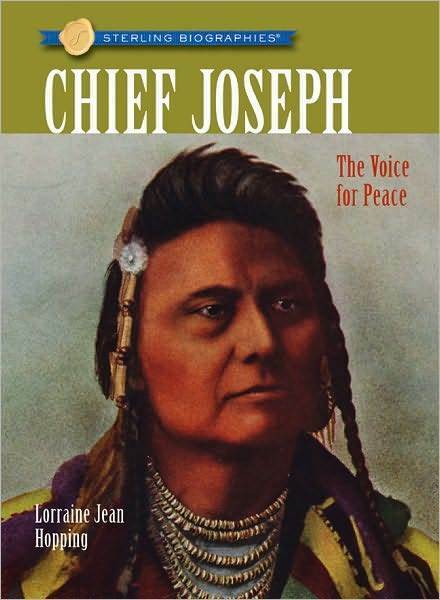 Chief Joseph: The Voice for Peace introduces middle readers and teens to a man with a big, heavy heart. Like peace advocates Martin Luther King, Jr. and Gandhi, this great leader of a Nez Perce band understood to the core that violence begets violence. Despite illegal actions and horrific acts against his people, he refused to give in to rage and revenge. When the U.S. government tried to seize his people's land in the Wallowa Valley of Oregon, he stood firm and negotiated rather than rebel. When ranchers moved onto his land anyway and murdered his friend, he pleaded with them to surrender or leave and kept his warriors from killing the murderers. When, finally, the U.S. Army threatened to remove his people by force to a small reservation in Idaho, he did everything he could to avoid an all-out war that the outnumbered, outgunned, Nez Perce would surely lose. "From where the sun now stands, I will fight no more forever." 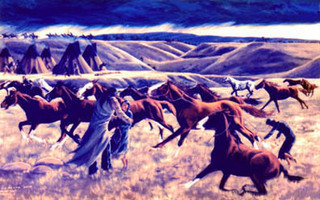 The so-called Nez Perce rampage was, in fact, a long, desperate retreat from five pursuing armies, triggered by the rash killing spree of a handful of warriors. In the summer of 1877, Chief Joseph, the other traditional Nez Perce chiefs, and their 700 or so family members were running for their lives to the safety of Canada. "If the white man wants to live in peace with the Indian, he can live in peace. There need be no trouble." Hopping wraps her cogent account of how the Nee-mee-pu (Nez Perce) were rooted out of their homeland and only subdued after a long and heroic pursuit around twin character portraits of the group and of its most renowned member. . . . [Chief] Joseph argued for peace before and during the tragic “War of 1877” and in later years too as he became a nationally known figure. Packed with fast action and detailed analysis, these new titles in the Sterling Biographies series blend the stories of Native American leaders with the history of their peoples, distinguishing myth and reality by documenting what really happened and focusing on ordinary people as well as chiefs and warriors. In Chief Joseph, Hopping tells of Joseph’s painful decision to leave his land to save Nez Perce lives, choosing peace because he knew they could not win against the U.S. Photos, maps, and historic prints throughout; also included are a detailed time line, glossary, bibliography, and fully documented notes. Chief Joseph was the Nez Perce’s main negotiator with the U. S. Army, and he made a name for himself through his strong belief in resolving conflict through peaceful means. Although he was promised that the Nez Perce would return to their ancestral lands, they ended up farther east in Montana. Joseph spent the rest of his life advocating for peaceful relations between his people and whites.... In all three [Sterling biography] books, the authors succeed in painting sympathetic yet realistic portraits of their subjects and the cultures in which they lived, especially in the case of Chief Joseph, whose pain at his people’s losses is clearly evident. What a wonderful read. The story was captivating and kept my interest... I wonder after reading this book how much our society has actually learned about tolerence and embracing other cultures and their beliefs. I found Chief Joseph an amazing and patient man. All he wanted was peace for his people and to go home to their land. He lost so much but kept fighting to the bitter end with dignity and tolerance, always hoping and praying that the goverment would do the right thing. I loved the way the author explained the political climate and the players... I would suggest everyone read this book. Chief Joseph is an important part of American history. "My favorite character is Frog (Joseph's brother) because I like how he will become the war general. Frog and I have something in common. We are both athletic." —Brendon C.